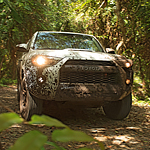 We at Toyota Of Plano love vehicles that can take you on adventures. This is the very reason that we have chosen the 2019 Toyota 4Runner. The vehicle has been built with the purpose of bringing forth that sense of adventure. The features make it clear for the driver and the passengers. One of the first things you are going to notice about the Toyota 4Runner exterior is the front-end design that makes it stand out from the others. Then there are other features that the 4Runner has which make it stand out even more from the competition. One feature you will notice is the chrome door handle which makes it look premium. Another feature of the vehicle that will make you want to take it out for a test drive is the chrome-accented front grille. The Toyota 4Runner has been designed with the purpose of showing a unique personality.